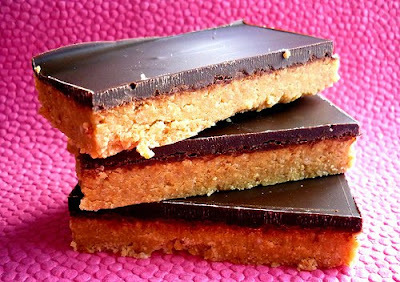 My sugar coated life...: My return...marked by peanut butter bars?! Well hello there readers! After a lengthy sabbatical I've decided that my brain is just too darn full of cakey love and if I don't dispose of it soon then there is a definite possibility that the sugar rush might just consume me. There's a baking bug currently sweeping the nation and apparently starting a cake business is one of the Top Ten start up ideas for 2011. Funnily enough, my blog still receives a heavy amount of traffic specifically aimed at charting my own journey, so I hope reading that has been useful to some of you! I'd love to hear your story so please do feel free to share it by leaving a comment and I can have a nosey at your blog/facebook pages. It's chocolate. And peanut butter. And digestives. And butter. This list of ingredients never fails to make my tummy flutter so when I came across this recipe I knew I'd have to make it at once. It's so easy and requires no baking and tastes AMAZING. For all you peanut butter lovers out there I urge you to try this one. I slightly increased the amount of peanut butter I used and I'd probably add even more next time as I love a good peanuty kick. Enjoy! Thanks Kerry - I've missed it so! !